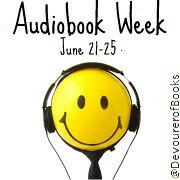 A Foodie Bibliophile in Wanderlust: Audiobook Week: When Do You Listen to Audiobooks? Yes! Doing those things without an audiobook does seem like wasted time. I get so mad when I realize I haven't charged my player and I have to go without! Thanks for participating this week, Beth!